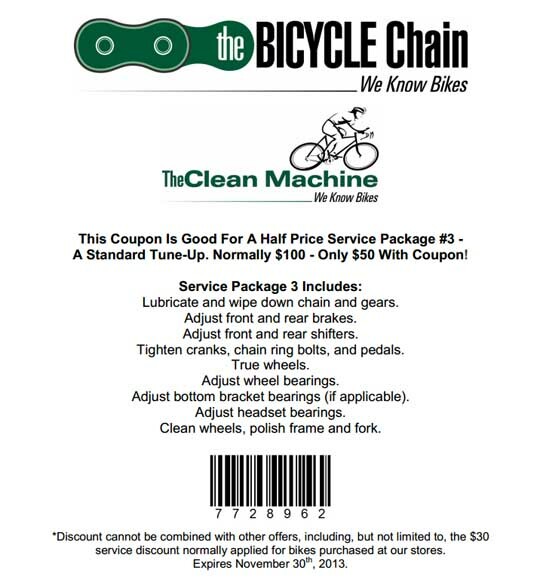 At the Bicycle Chain Store, there’s currently a 50% off coupon for bicycle tune-ups and other service packages. This coupon applies and is valid for the month of November. 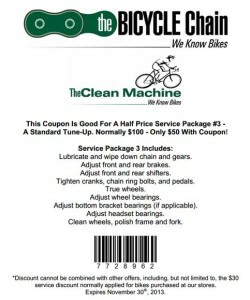 This service package that you get for your bicycle typically costs a retail price of $100 bucks however you can now save 50% off and make it now cost only $50 next time you head over to the Bicycle Chain Store. Everyone owns a bicycle, either for long distance treks or even the short cruise, but the truth is that all bikes need to be maintained and this is what tune up packages are here for. Not everyone knows how to properly tune a bicycle themselves and they want to make sure they send it over to the experts, like the guys at The Bicycle Chain store. 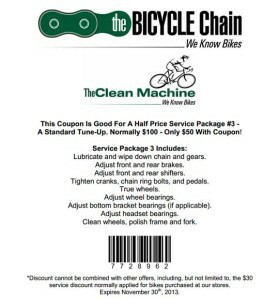 Take advantage this November and save some serious cash on your Bike tune-up.